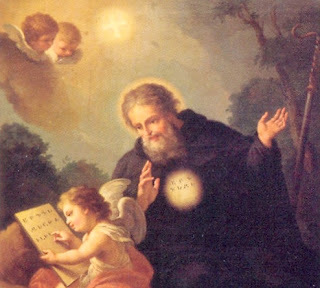 Above: Part of a painting by Francesco Majotto showing Mesrop Mashtots inventing the Armenian alphabet. 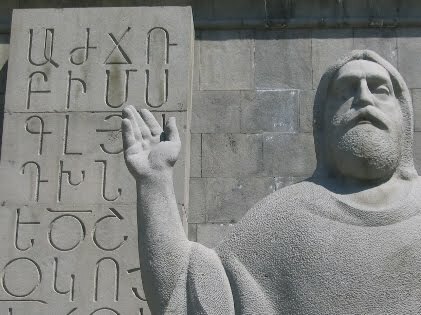 I don’t think I had any access to information about the Armenian script back in those days (pre-Internet times). The dictionaries and encyclopedias of that era often included a chart showing the Phoenecian, Hebrew, Greek and Roman alphabets side by side, but the odds of seeing a table of Armenian (or other exotic) glyphs while living in small-town Florida were next to nil. So, this leaves me wondering if the similiarity is sheer coincidence, if I saw a sample of the Armenian alphabet and forgot seeing it, or if there is some supernatural force at work (ghosts, reincarnation, etc). None of these explanations seem likely. March 31st is World Backup Day, an annual opportunity for humans around the globe to think about the importance of backing up any computer files which would be hard to replace. You can read more about it at worldbackupday.com or enjoy the snarky and technical discussion at Slashdot. Many Mac users are satisfied with the built-in Time Machine app but I feel it’s important to have some backup copies located somewhere other than home. Personally I have become a fan of online services such as Dropbox and Mozy. Something I wonder about (but haven’t reached any conclusions about) is how to back up creative stuff that only exists on paper. I guess maybe I should photograph or scan all that stuff and add the images to my online backups. Barbara Newhall Follett was a brilliant young woman who had a couple of novels published at a very young age early in the 20th century. In 1939, at the age of 25, she vanished. The webmaster over there has posted more information about the language. [sadness], clearness and vagueness-- however, fune stands neither for sadness or vagueness in a sad sense-- rather seriousness and quiet dimness. there is a tense of wishing a thing might be, a sort of subjunctive, but untranslatable in English-- an elusive, ideal consummation, a dream, highly improbabl[e] or even impossible of realization. That tense is formed by the suffix -ril to a verb. "The dream of my life would be to go there"-- na oparil. The Cult of the Hyperpolyglot (BBC). Are You a Hyperpolyglot? The Secrets of Language Superlearners (Time). Some of you will recall surveys taken in the Conlang mailing list in years past revealing that many inventors of new languages are left-handed, gay and have beards. Mr Erard says hyperpolyglots are more likely to be introverted, gay or left-handed. An audio recording of an interview with the author is available here. Google Translate has added Esperanto to its list of supported languages. It will be interesting to watch this and see if the quality of the translations improves as time goes by. (The software supposedly trains itself to get better and better.) As you can see in my simple test above, two of the three short sentences were translated correctly; the final one was botched. If you're not terribly busy, check out the article How Google Translate Works by David Bellos. I just stumbled across a blog that mentions some newly invented writing systems that have been proposed for minority and endangered natural languages. The blog is called Anshuman Pandey (apparently named after its author). If you enjoy encounters with new writing systems or you are browsing for special glyphs to inspire your own work, this is a blog worth watching. Interesting articles include a script for the Tani languages of Arunachal Pradesh and a script for the Dhimal language of Nepal. Version 6.1 of Unicode, the ultimate system for computerized encoding of all the world’s writing systems, has been released. A summary of the changes made from version 6.0 to 6.1 is available. The book Learning ROILA was published a couple of months ago. “The RObot Interaction Language (ROILA) is a new spoken language that is optimized for the communication between machines and humans. It is extremely easy to learn for humans and it is simple for machines to recognize.” Available from Amazon. It’s quite interesting to read about how the language evolved, how words that Hughes pulled out of thin air* turned out to have similarities to words in ancient languages, and how Orghast served as a lingua franca for the multinational theatre company on a few occasions – there was one situation in which a member of the group sent them a telegram written in Orghast. If you are interested in artlangs, I recommend the book. There are lots of thought-inspiring quotations from Hughes about the relationships between the human body, poetry, and human languages. *Perhaps “pulled out of thin air” is a poor choice of words. Hughes said he created each word through a long meditative process.